Schmer may not be as well-known as the parent label Serotonin, but the return of both to the vinyl crates deserves a good applause. 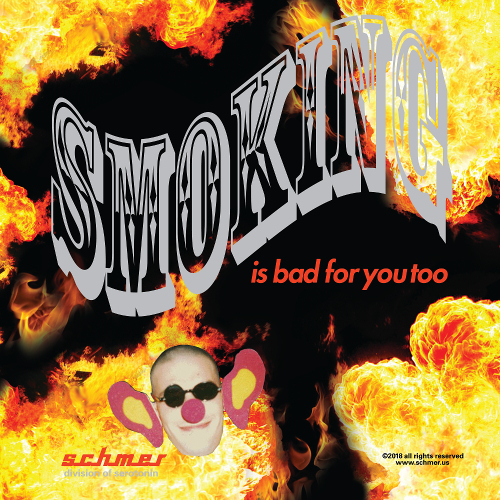 On Schmer, where acid techno fraternity Prototype 909 used to tell that kids don’t care, re-emerged with a few records in 2017 and in the current various artists compilation the imprint run by Jason ‘BPMF’ Szostek reverts to the ‘smoking is bad’ theme used on several Schmer releases before. Several new female artists from the American continent are behind “Smoking is Bad For You Too”, and especially dominant is Isabella Koen from Boston has previously appeared on labels like Börft, Peder Mannerfelt. She slams the door open with the 150 BPM gabber soaker “Spun Out”, a rattling and grinding thing that is firmly attached to the raveground. Other tracks step down from the BPM race and move between abstract beats and moody electronica. Ciel’s “Bad Luck Comes In 3s (Lucky Version)” travels through cornfields and abandoned gas stations, to finally enjoy the fresh air of ocean shores. On the B-side, gritty grooves of her native Chicago can be perceived in Hiroko Yamamura’s percussive “Babyayez”, while Experimental Housewife from San Francisco and Andrew Bowen aka Bilagáana are locating “Free Ends” with grim distortion and luminous synth tolls.